RockRoots has become a powerful tool in an arts-integrated education as a chronicle of American history, music, geography, and social culture. It is a strong musical performance, introducing a broad spectrum of musical styles performed by skilled musicians. It’s also highly interactive and entertaining, while creating school community. 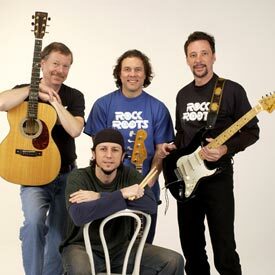 RockRoots—the History of American Pop Music—was developed by teaching artist and musician Dave Fry, and has been performing in schools and at festivals for 23 years, winning PA Public Television’s Best Children’s Programming Award in 1991. The band is Dave Fry, guitar and mandolin, along with Kevin Soffera on drums, Nick Franclik on bass, and Steve Placotaris on electric lead guitar. All band members have years of stage, studio, and classroom experience. RockRoots has been on the YANJEP roster since 1991. RockRoots was the best assembly I've seen in 23 years at our school! It was informative and educational, fun and entertaining, musically top quality....We ALL enjoyed it—kids and teachers together! It was a very uplifting program that moved along so smoothly that I was sorry it was over! You had command of the topic, taught us all a lot and kept it interesting, and controlled the kids. I can't wait for you to come back!!" Rock Roots was phenomenal. The students and teachers and staff all loved the program. Wonderfully educational and entertaining at the same time.